It's so nice to be back in Irosin, my hometown after one year and 8 months! I have only been here for a few days after 12 hours of land travel but I am already making the most of my time so that when I am about to leave, I can make a nice Irosin travel guide. 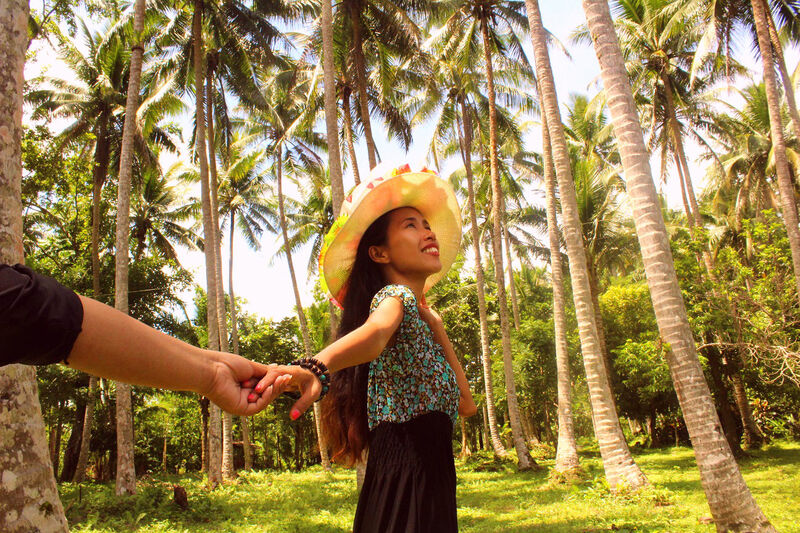 Irosin is a town in the province of Sorsogon that's known for agriculture. 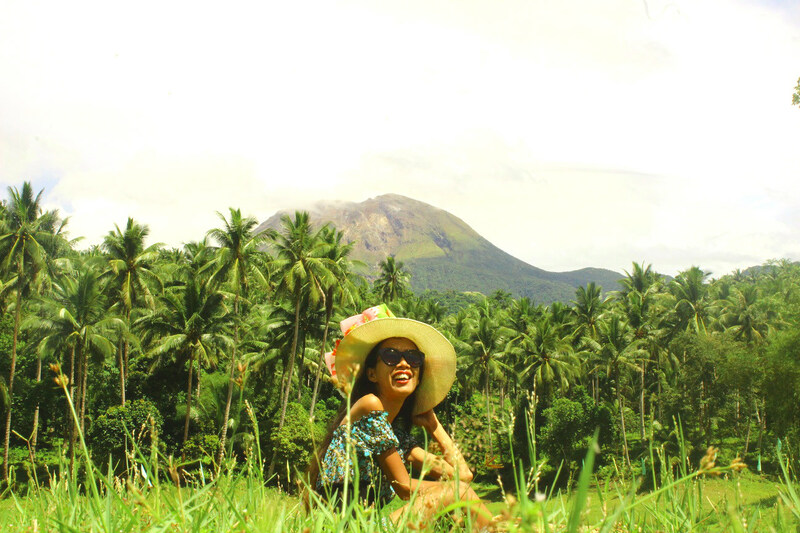 It is the only landlocked municipality in Sorsogon that's why I grew up with less memories of beach escapades. We had to go to the nearby towns of Bulusan, Matnog or Talaongan when we need to soak our bodies under saltwater. My childhood is all about going to hot & cold springs, rice fields and of course lakes. Today, I and my fellow sisters revisited Danao in Barangay Patag. I have known this lake since I was a kid - my uncles and late grandpa used to fish here. 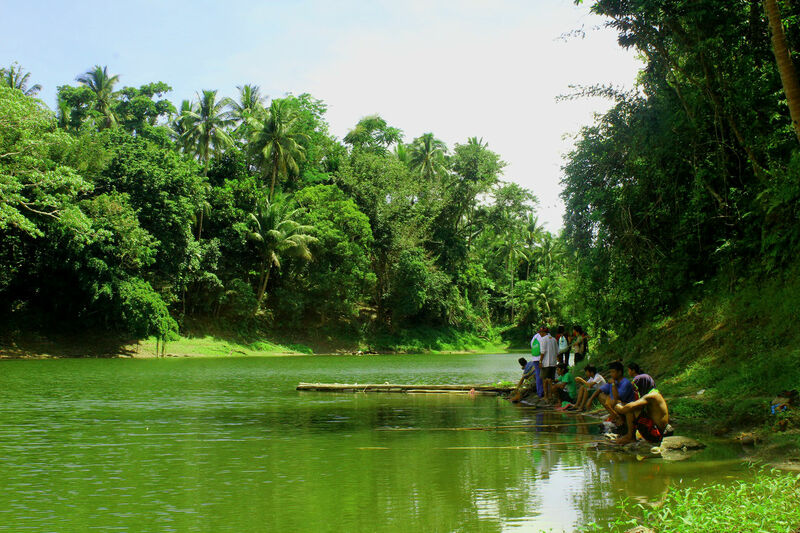 My mom grew in this barangay too but it will take 30 minutes of walking to reach this lake. 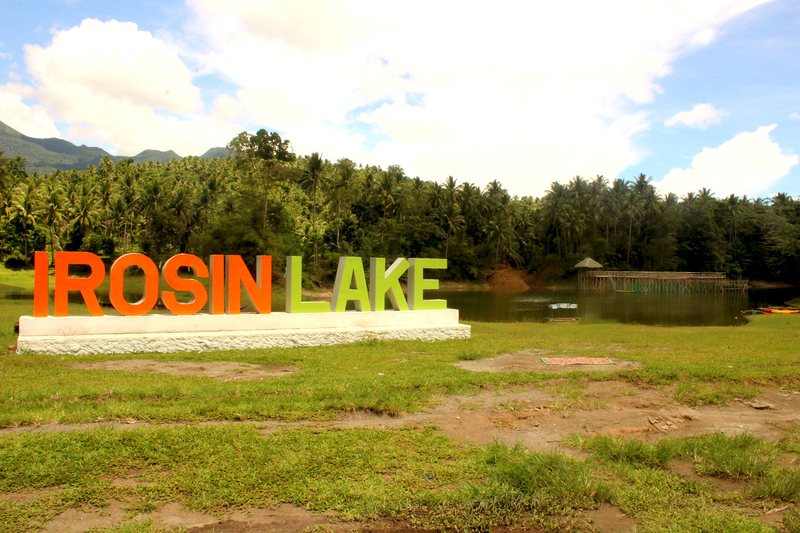 I have learned that Danaw was renamed officially by the present local government administration as Irosin Lake just recently as part of its efforts to promote the tourism of Irosin. 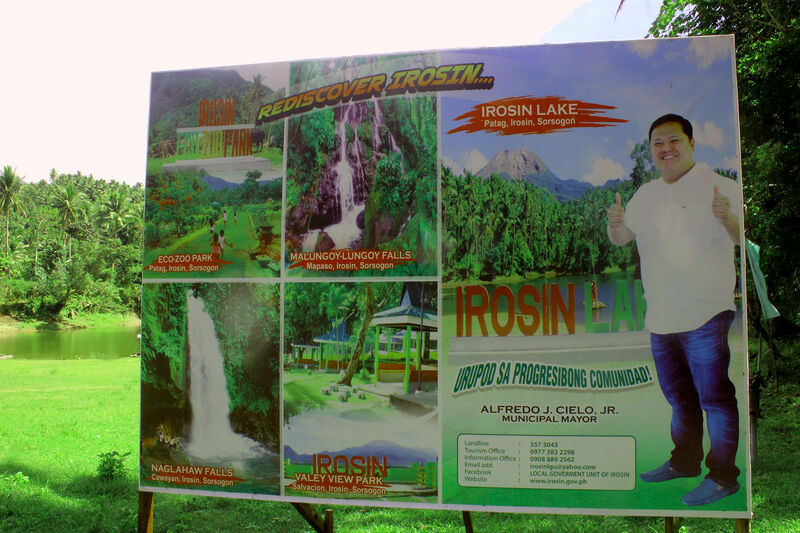 I actually feel a bit awkward to call it "Irosin Lake" because all of us know it as Danao or Danaw. Our visit HAS two more reasons: to see the sister of my mom, Tita Emma together with her family who live just ten-minute walk away from the lake and to have our official photo entry for the #chippykadabucketlist of Chippy. Tita Emma lived near Irosin Lake for over 15 years just right after she started building a family of her own. If there's someone else I should ask about this Irosin Lake who can tell tales, I know she is the one. I asked her how Irosin Lake came to being. She said legend says long time ago, there was a very big tornado that hit that spot. It created a very deep hole. Extensive raining filled this lake with water over time. However, geologically speaking, it is said that this lake in Irosin used to be a crater of an inactive volcano millions of years ago. As early as now, I would like to remind you that swimming is NOT advisable in Irosin Lake. I will explain why in a few moment. We arrived close to noon time which means the sun is out there at its peak. As much as we want to do so much, we had to give way to the glaring sun and just chill out by taking photos. We were also trying to squeeze in two more places to see in Irosin which is the Naglahaw Falls and Irosin Eco Zoo Park so we aren't really not spending the whole day there. Kayaking, boating and bamboo rafting for me are the three best things you can do in Irosin Lake. The four colorful plastic kayaks remind me of the ones in Bulusan Lake - this is perfect for visitors who come in pair. Same thing with bamboo raft. Boats are long enough to cater small groups. Please take note that if you want to do fish viewing or feeding, you will need to rent a kayak, boat or bamboo raft because the bamboo cage are in the other side of the river. This means, you need any of these to get there. Irosin Lake is huge covering an area of 46, 000 square meters. It's located in the Kamumbugan area of Barangay Patag in Irosin. 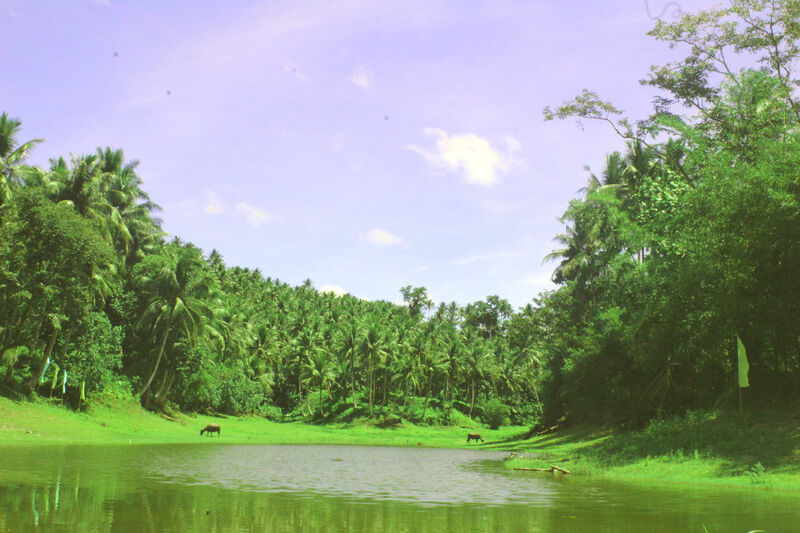 This is the part of Patag where it's foresty - there's a river, lots of trees and coconuts dot this area. Ten years ago, only few houses are built here but now it is becoming a residential area with access to water and electricity already. Irosin Lake's water doesn't go anywhere else. In other words - it's stuck there for life. Tita Emma said they used to swim and dive there but now they don't do it because carabaos (water buffalos) made it as the official place to dip and cool off their bodies which is called as lab - ugan in the local dialect. NO room to stay for those who want to spend overnight. Irosin Lake is currently advisable for day tour visit only. There are two open wooden cottages with roof then tables & chairs outdoors that are free to use so far. We strongly advice to bring food or cooked meals. They have a sari - sari store but it is not open all the time. Please be reminded that the surroundings of Irosin Lake is a natural habitat of some animals. Do NOT disturb or scare them away. We have seen big birds, deers, bugs, beetles and carabaos the whole time we went there. Let's respect their home. Wear light clothing or bring less because this is an open field and most probably, you'll be enticed to take a kayak or go boating. There's no room for you to keep your belongings so pack light. 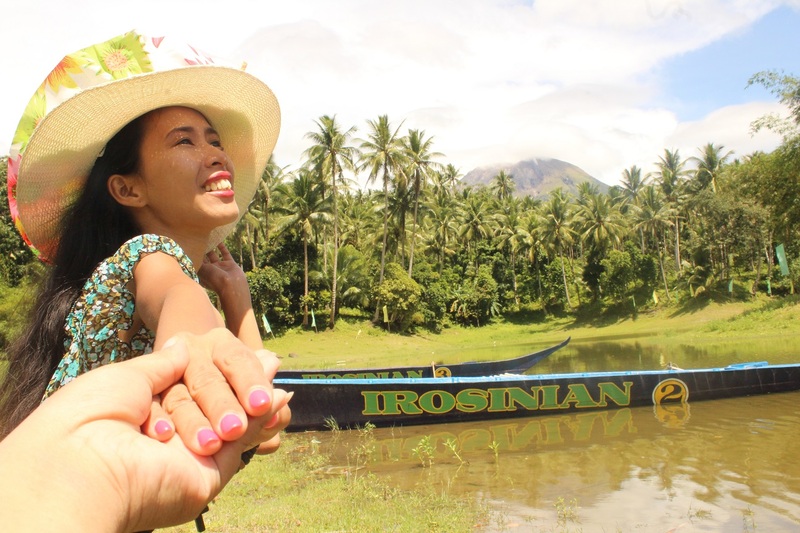 Irosin Lake has the best backdrop of Bulusan Volcano. Please respect the locals who spend hours sitting by the lake to catch fish. Don't be shy to talk to them because they know so much about this lake. 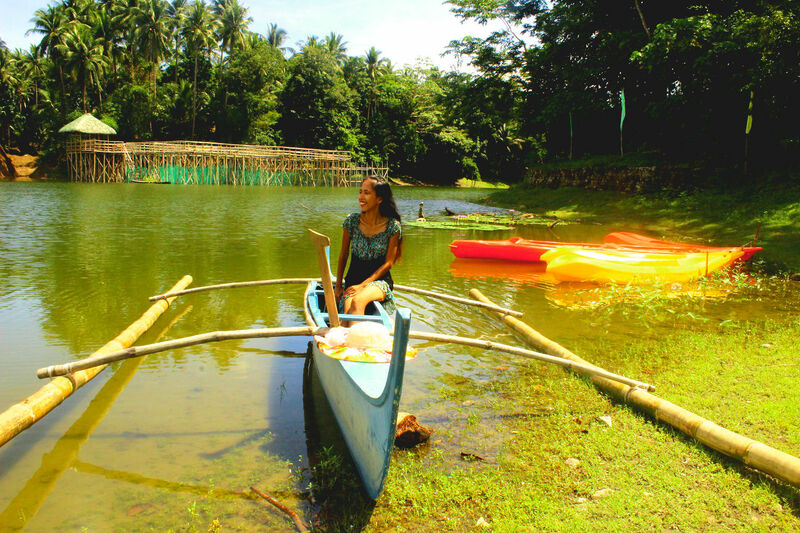 Danao Lake in Irosin is newly - developed tourist attraction in Sorsogon. Please do not expect stellar amenities when you get there. "Comparing the fees of other waterfalls I have been around the Philippines, I personally find the Php 250 tour guiding fee to Naglahaw Falls and Malungoy-lungoy Falls are expensive so we did it DIY. I suggest they charge smaller fees for folks of Irosin. My sister who has been there so many times, guided us. It will only take 45 minutes of trekking to reach this falls from Irosin Lake. If you are a first timer and do not know any local, I think it is still worth it to pay for this. Tour guiding is courtesy of Patag locals who are members of PADAPIAS (Patag Danao Lake Fishers Association) lead by Edwin Fruto." NEXT GOAL: To write about Irosin's caves: Escuela Cave in Buenavista, Sulihan Cave & Mapinit Cave in Patag and Mor - Ing Cave in Gumapia. I do not have any idea how to get here nor have any contacts, I need recommendations. Please, if you know any person here in Irosin to help, let me know. NOTE: This visit is the author's personal trip and sharing her own experience. While she finds it a hard time to get in touch with the LGU Irosin for research purposes (she tried a few times), she strives hard to make this guide to Irosin Lake useful to everyone. For any update or any corrections please let me know, will be glad to edit the article. And lastly, if you know anyone from the authorized people of this lake, please do let them know so I can politely send them questions for this guide to be a reliable source about this park.